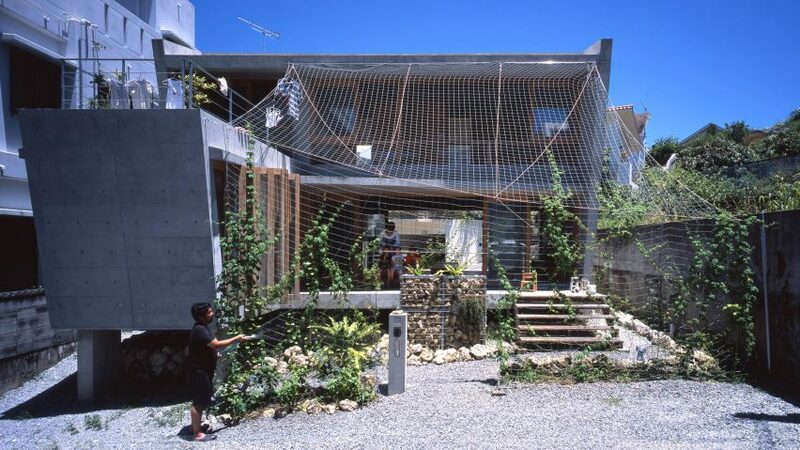 Large eaves and a metal-mesh canopy that will eventually be covered with plants help to shade the interiors of this concrete house on Japan's Okinawa Island. 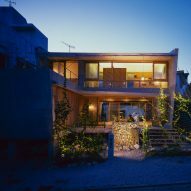 Osaka-based studio Ryuichi Ashizawa Architects designed the house called Ma of Wind for a plot in a residential area southwest of the 14th-century Shuri Castle, on the island in the East China Sea. 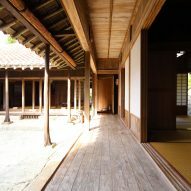 The building is a contemporary take on vernacular Okinawa architecture, which the studio said is "characterised by a respect towards the natural environment, and maintaining harmony between man and nature." The design employs a variety of traditional methods to create a comfortable living environment that responds to the climatic conditions of the site. "Sun, wind, water, and the unique climatic features of Okinawa Island together modelled the design as a space exposed to the prevailing winds, looking to south and north for enhancing natural ventilation," said the architects. The building features a reinforced-concrete shell that provides the necessary protection from the typhoons that regularly impact the island. A floorplan that reinterprets the layout of traditional homes incorporates an open-plan living area and kitchen at the centre, which is flanked by sheltered terraces. The living spaces and a perpendicular guest wing are lined with sliding or folding glass doors that can be retracted to open up the rooms to the outdoors. 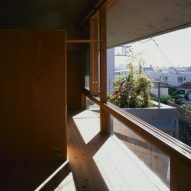 To achieve a comfortable environment inside the house, the architects needed to prevent the harsh sun from overheating the building. This was achieved in the first instance by designing a structure with large eaves that project over the terraces and shade the interiors. 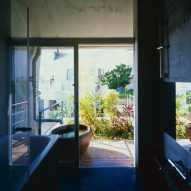 The resulting form also evokes the traditional aesthetic of the island's residences. The north and south facades are covered with a steel mesh that provides a trellis for climbing plants to grow across. The plants form a screen that shades the building in the summer and ensures it is not overlooked by its neighbours. "Depending on the season, vegetation engulfs the house, fusing architecture with nature," the studio explained. In the winter the plants shed some of their leaves, which enables daylight to reach the interior. Another natural cooling strategy sees the integration of two small ponds alongside the building that cool warm air as it approaches the house and reduce the need for mechanical ventilation. The house is raised above the ground on a concrete podium and the cooled air is channeled through the interior by openings in the floor. The ponds are filled with rainwater collected on the roof, which is also used for watering the plants. The property's open-plan layout is influenced by Le Corbusier's iconic Dom-Ino concept for mass-produced housing featuring concrete slabs supported by a minimal number of reinforced-concrete pillars around the edges. At the Ma for Wind house, a similar effect is achieved by embedding structural beams in the floor slabs to prevent the need for supporting walls that would disrupt the spaces. Photography is by Kaori Ichikawa.